Good health and fitness is now the primary concern of everyone. Doing workouts and engaging yourself in regular physical activities is the best way to keep you healthy and fit. But due to our regular hectic schedules from 9 to 7, it is not possible to join the gym every day. Imagine- How good if you have the best exercise equipment at your home. It really feels that you are working out in a gym without spending much. Now, most of the people are more concerned about their weight and trying different ways to maintain their weight. But when it comes to weight loss, nothing is ever best than the Exercise Cycles/Bikes. So, welcome to this new blog that is all about the best exercise cycles for weight loss. Exercise cycles are completely different than the regular outdoor cycles. We all know that outdoor cycling is the best way to stay healthy and fit but for everyone, it is not possible to go for the outdoor cycling. 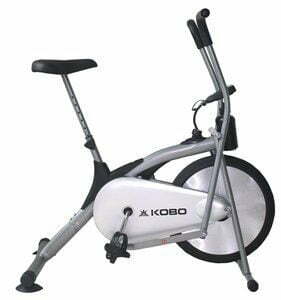 And here comes your perfect companion- The Exercise Bikes/Exercise Cycles for a perfect workout a home. An exercise cycle is the same as a stationary cycle and comes with a saddle, handlebars, peddles, a monitor to record your heart rate and work done, and some other useful options. 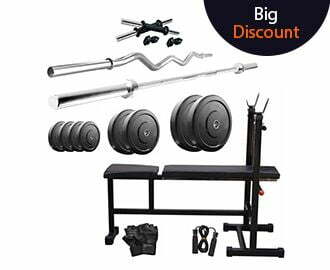 The very best part is that it is very easy to use, as no balance and coordination are required like the treadmills and conventional bikes. And thus it is the perfect workout equipment by which you can lose calories and stay fit. These exercise cycles are designed the same way like traditional road cycle. Here the seat is positioned directly over the pedals and handlebars are located to the equal height of the seat. 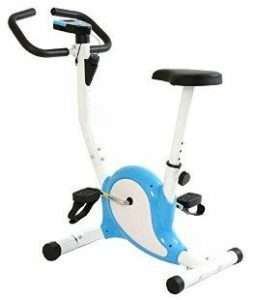 In these exercise cycles, the seat is positioned nearly in line with the pedals and is very comfortable to use than the upright stationary exercise bikes. 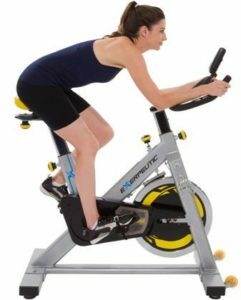 These type of exercise cycles/exercise bikes are designed in such a way that combines the movement of the handlebars and the pedals. Thus, allowing you to clutch an upper body workout along with the lower body workout. And so, it’s a great way to build up muscles. These look very similar to the upright stationary exercise cycles or like the normal road bikes. Here both the upright seat and forward handlebars are used. 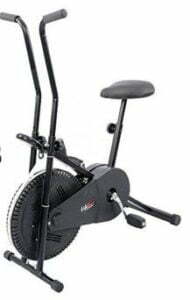 These exercise cycles generally use a weighted flywheel that is connected to the pedals via a transmission system for the resistance. If you are searching an exercise cycle for your home gym, you are absolutely visiting the right place. 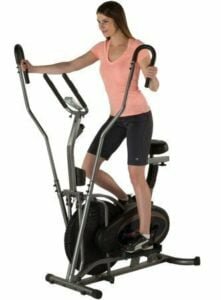 Getting confused among different models and types of an exercise cycle? 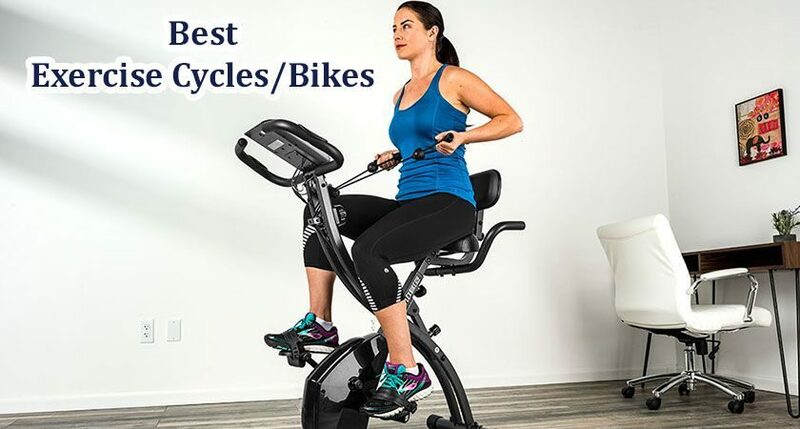 Don’t get worried as we came with this blog post mentioning the best and latest models of exercise cycles/Exercise Bikes from the topmost brands. So have a quick look at the below-listed models before diving into the full review of each one. For both upper and lower body workouts, this exercise bike is a perfect choice. If you want a comfortable, smooth, and fairly full body workout, this one is absolutely a must-have in your home gym. It comes with a comfortable and adjustable seat that makes your workout even more comfortable. The very best part is that this exercise cycle is preferable for all age groups, shape and size. Looking for a cost-effective solution for your everyday fitness needs, this exercise bike is the best to go for. It is equipped with 4 Kg flyweight that offers a smooth cycling experience. Also, the 8 tension control levels suit different athletic needs. The seat is comfortable and adjustable that you can easily adjust according to the height. It comes with a display meter that displays your speed, time, distance, pulse, and calories. This Exercise cycle is an excellent choice for every health-conscious people at an affordable rate. 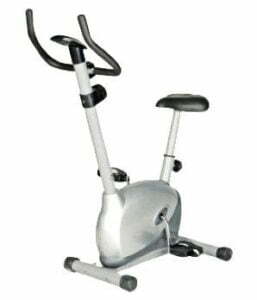 Get on with your health regime by purchasing this decent exercise bike for your home gym. It comes with ergonomic adjustable-reach arms with padded grips that make it more comfortable to use. The adjustable seat and handle position makes it a great choice for all age-groups. 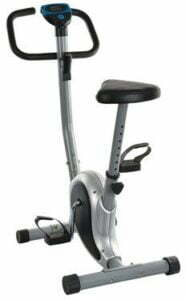 For all your fitness cravings at an affordable cost, this exercise cycle from Iris is the best choice. Get an amazing workout experience at home like the top-quality gym with this exercise bike. This exercise cycle is appropriate for all age groups. And is an ideal choice for building muscles, fat loss, improving cardiovascular health, and blood circulation. No reviews yet. Will be updated when available. Crazy about the weight loss? 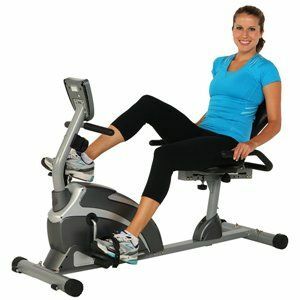 This Exercise bike from Onlineworld is absolutely the perfect buy for all your fitness needs. It comes with a sturdy steel frame for its long life and equipped with a belt drive that ensures smooth pedaling. There is also an LCD display panel that tracks your distance, calories burned, and time. This is all about our best picks for the latest exercise bikes/ exercise cycles that you can use at home to stay fit and healthy. These are very cost-effective as well as eco-friendly exercising equipment that offers amazing health benefits. 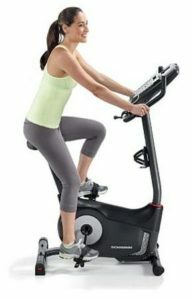 I hope the above buying guide will surely help you in picking out the best exercise bike for your home gym.